Plastic laminate countertops are extremely popular for many reasons. It is a very durable material, and it comes in a variety of colors and finishes. They are versatile and can be used in many settings, from kitchens to bathrooms and more. Hiring a professional to install a countertop could cost you around 50 percent more than if you were to install it yourself. The most crucial step to installing a new countertop is ensuring that you make accurate measurements. If your kitchen has only one inside corner, it should be easy to measure and install a countertop yourself. 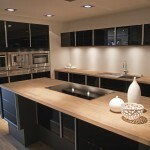 If you have a U-shaped kitchen, however, it might be best to seek professional help. First you should make a sketch of the kitchen, then begin measuring from the back walls. Measure from the walls to the edge of the cabinets, then add about 3/4″ to allow for overhangs. An extra inch should be added to freestanding areas, as it will be easy to trim it for a better fit later, and it is best to have a little extra counter on the ends than not enough. Next you should measure the depth of the base cabinets, and ensure that there is an extra 1/2″ for overhangs beyond drawer fronts. Record all your measurements on your sketch then take it to a countertop supplier to make sure you haven’t missed anything. The first step to actually installing the countertop is to attach build-up strips to support the countertop over your cabinets. Countertops appear to be thicker than they actually are, as the underside of the countertop has a depression that is about 3/4 in. deep. The build-up strips will guarantee that the countertop is elevated above top drawers. You can get premade build-up strips from countertop manufacturers, though it is possible to create your own if you desire. The best place to start installing the countertop is to scribe the longest corner section, since most other sections will connect to it. Miter bolts are used to temporarily join sections of the countertop, so use them to join the corner together. When doing so, make sure the front of the countertops are parallel to the cabinet fronts. After scribing, use a belt sander to sand down the back edge of the backsplash. Also make sure that there are build-up strips behind the sink and on each side, as it will need lots of support due to its weight. Be very careful when cutting the sink, as you will want it to be far enough back from the cabinet front, and you will also want it to be centered. Flip the sink over and trace it, then make a line 1/2 in. inside the trace line. This is to ensure that you cut a hole smaller than the actual sink rim so that it fits well and also has support around all edges. For stainless steel this should be enough, but for cast iron an additional 1/2 in. should be added for further support. Drill some holes inside your trace lines, then flip the countertop and connect them with a pencil. 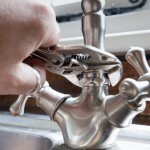 Cut along the line with a jigsaw, then make sure that the sink fits properly. A sharp handsaw should be used to cut the end of the countertop, though it is possible to use a circular saw on the underside if you are very careful. Use masking tape and a pencil to mark where you will cut. After cutting, sand down the edge with a belt sander. Glue on a build-up strip on the end and wait until it is dry, then apply matching laminate over the edge. Precut end caps are available from many manufacturers, but you can cut your own from some extra laminate. Use contact cement on the surfaces where you are applying the end caps, then wait about 20 minutes for it to dry. Next, position the end caps evenly along the edges and press them firmly with a dry cloth. Steel anchors are essential to support your new countertop. 1-1/2 in. anchors are the most ideal, and they should be screwed into the countertop and cabinets using 5/8 in. number 8 screws. After anchoring the countertop, the final step is to apply caulk where the backsplash meets the wall. Apply it evenly along the seam, then finish by smoothing it with a wet cloth.